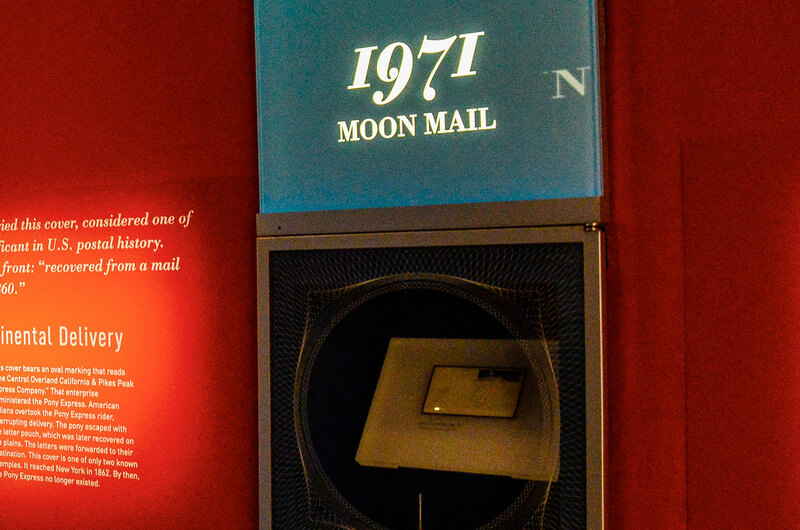 — The first and only envelope to be postmarked on the surface of the moon is now on display as part of the world's largest postage stamp gallery. The Smithsonian opened its new William H. Gross Stamp Gallery at the National Postal Museum on Sunday (Sept. 22). 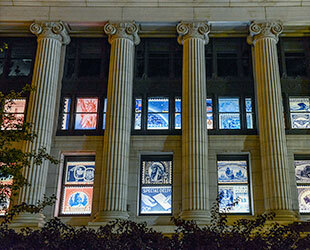 Named for its primary benefactor, a philanthropist and philatelist, the Washington, D.C. gallery showcases U.S. and international postage stamps and mail in the context of America's history and culture. 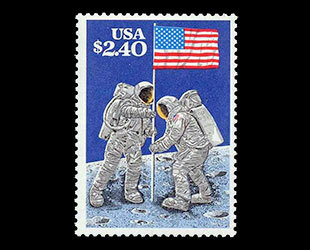 Among its more than 20,000 items on exhibit, the Gross Stamp Gallery highlights several examples where stamps have helped commemorate and mark milestones in space exploration history. Displayed alongside other "Gems of American Philately," including the United States' first stamps, mail delivered by the Pony Express and the infamous "Inverted Jenny" error stamps, is the only mail to be postmarked on the surface of another celestial body. "Like gems of the mineral world, these stamps and pieces of mail are rare and highly valued," reads the sign inviting visitors into the stamp gallery's "Gems" exhibit. "They tell stories about important moments in U.S. history, from the Stamp Act and the American Revolution to the Apollo 15 Moon landing." 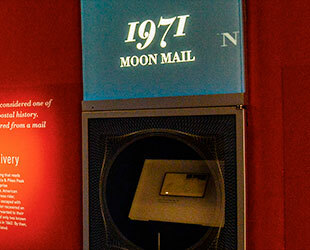 The so-called "Moon Mail" dates back to Aug. 2, 1971 and the fourth mission to land men on the moon. Apollo 15 commander David Scott was driving around the moon's Hadley Rille on his third and last outing when from under his seat on the lunar rover he pulled out a pouch. 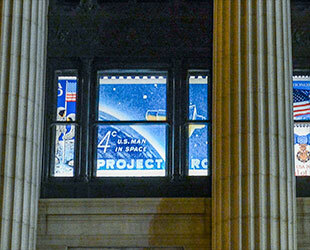 From inside the bag he retrieved an envelope affixed with the die proofs for two new space-themed postage stamps. 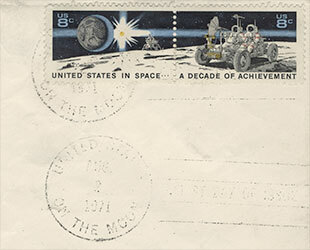 Using a rubber stamp, Scott postmarked the double-pane, which depicted two astronauts riding on the lunar rover — much like he and his Apollo 15 crewmate Jim Irwin — and commemorated the "United States in Space... A Decade of Achievement." Meanwhile, some 238,000 miles away, the U.S. Postal Service (USPS) issued the same stamps on Earth. As visitors to the Gross Stamp Gallery can see firsthand, Scott postmarked the envelope (or "cover," as collectors call stamped envelopes) twice. The first mark Scott made was faint, so he made another below it. Other smudges on the envelope are not ink, but instead moon dust, left by Scott's gloved hand. The "Moon Mail" was in and of itself a second try. 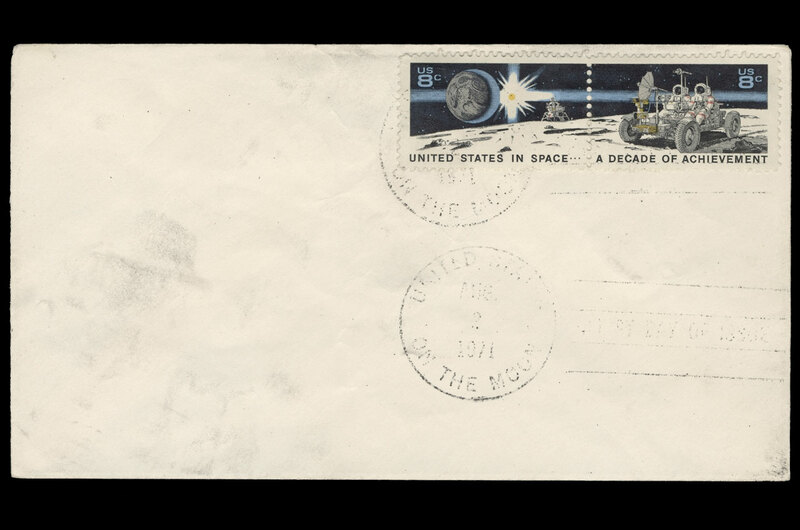 The postal service originally intended for astronauts Neil Armstrong and Buzz Aldrin to postmark a cover as a part of the first moon landing, but the Apollo 11 crew members forgot about the envelope until they were already on their way back to Earth. Over the past 65 years, the USPS has issued nearly 100 different stamps commemorating space exploration. Two of those space stamps are can be seen even before visitors enter the William H. Gross Stamp Gallery. 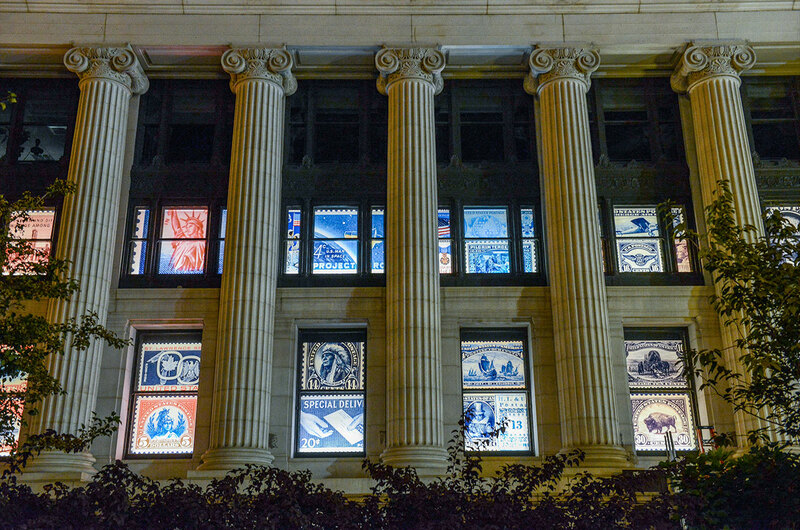 A wall of exterior windows, which overlook Massachusetts Avenue, depict enlarged reproductions of 54 historic U.S. stamps, providing a dramatic nighttime glow and a preview of what is inside the Postal Museum's 12,000 square feet (1,115 square meters) of new exhibit space. 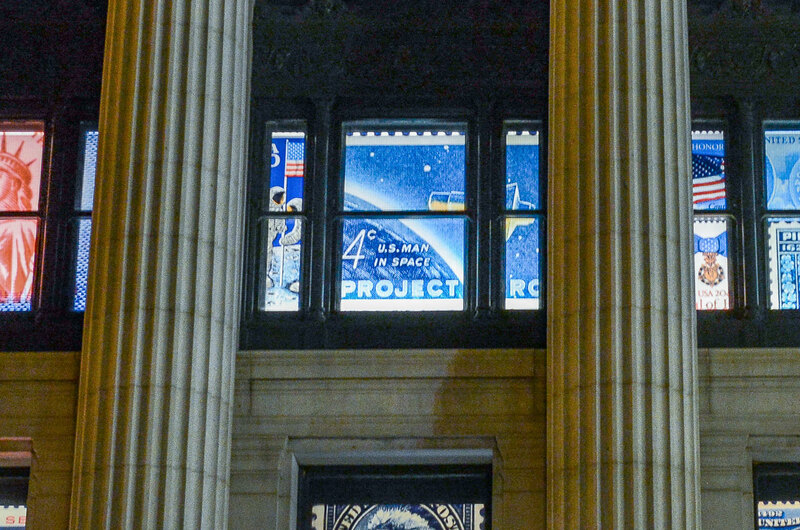 Among the window displays are the 1962 4-cent "Project Mercury" stamp and the "20th Anniversary Moon Landing" stamp issued in 1989. The then-Post Office Department commemorated the first orbital flight of a U.S. astronaut with the surprise issuance of the "Project Mercury" stamp, which was placed on sale across the country at the exact hour John Glenn's historic Friendship 7 capsule splashed down. 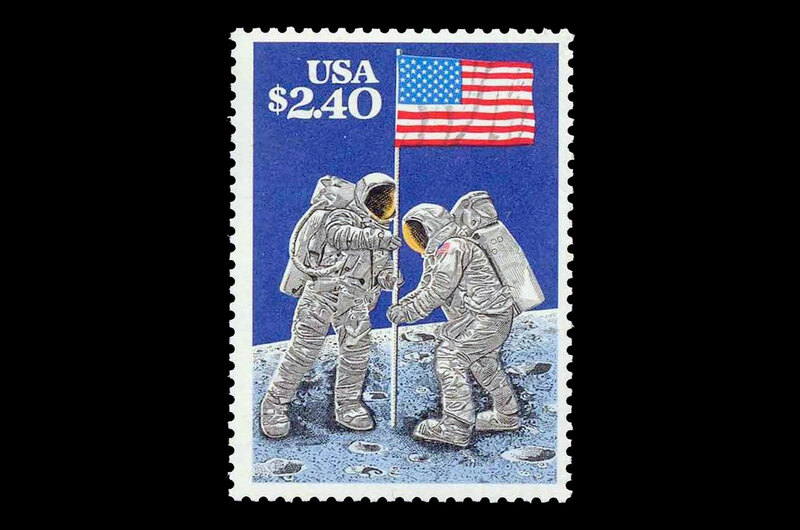 Nearly three-decades later, the USPS celebrated 20 years since the first moon landing with the issuance of a $2.40 Priority Mail stamp designed by Chris Calle, the son of the veteran illustrator Paul Calle who created the artwork for the original 10-cent "First Man on the Moon" 1969 stamp. The 20th Anniversary Moon Landing stamp holds another distinction inside the Gross Stamp Gallery. In 2010, the National Postal Museum invited the public to vote on what stamp should represent the United States in its planned International Collections exhibit. Garnering 50 percent of the more than 13,000 votes cast, the 1989 moon landing stamp won the poll and its place in the new gallery. Located at 2 Massachusetts Avenue N.E. in Washington, DC, the National Postal Museum's new William H. Gross Stamp Gallery is open daily from 10 a.m. to 5:30 p.m. For more information, see: www.postalmuseum.si.edu.